There are four different ways that your Moodle Course can be formatted, Weekly Format, Topics Format, Social Format, and SCORM Format. By default, content In Moodle is arranged by Weekly Format. 1. The Weekly Format is where course shells have the official dates for LSU pre-set to show the Number of Weeks & Date Ranges for the current semester it is being taught. 2. The Topic Format allows you to organize the course by content, units, topics, etc. Allows for more formatting flexibility when building your Moodle Course. 3. The Social Format creates a page that is centered around discussion. It is simple in its layout and useful for free form situations. 4. The Single Activity Format only has 1 section, and allows the teacher to add one activity only to the course. LSU Faculty, Instructors & TAs can change the format of their Moodle Course from Weekly to Topics by following the steps below. 2. Click on the Edit settings link in the Administration block. This takes you to the Edit settings screen. 3. On the Edit course settings screen, click on the arrow next to Course Format. 4. In Course Format, select the Format drop down and select the Moodle format you would like. 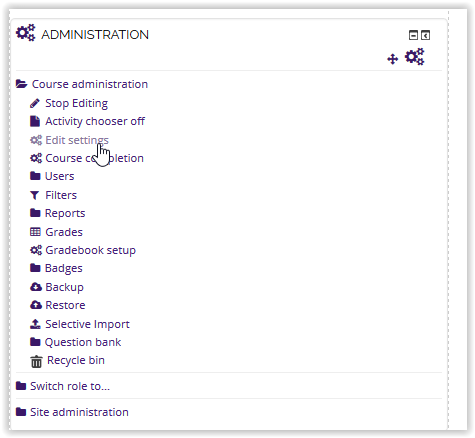 You can also choose how many sections/modules that will appear on your course page. 5. Scroll down to the bottom of the page and click on Save and Display. This will change your course format and take you back to the main course page.